We’ve been asking all manner of music-related folks for 2014 Top 10 lists. Most have championed things that are awesome and here’s one that does that too, but in a bittersweet way. 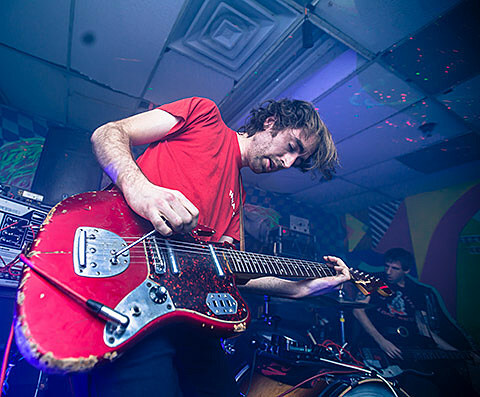 A Place to Bury Strangers frontman Oliver Ackermann was one of the people behind Death by Audio, both the DIY showspace that closed last month and the effects pedal company that has now relocated. Fittingly his list is titled “10 Best Things That Ended in NYC in 2014.” You can check that out below. In non-ending APTBS news, they will release their new album Transfixiation on February 17 via Dead Oceans. It’s messier and more experimental than we’ve heard them do before and is all the better for it. The LP also has its share of rippers as well, like the bass-driven first single “Straight.” Since we last posted, the band have released a video for that, directed by Brook Linder. It’s a headtrip of spooky imagery and VHS tape distortion. You can check that out below too. 1. Verb Cafe – This place was the lower east side vibed coffee place in willisburg with killer bagels and really intense coffee and better than dunkinbuck. 2. Kings Pharmacy – Move out the way for duane reade and drug world and cvs and right aid and publix. There was a dj trapped in a caved in stock room still spinning records since 1987. 3. Goodbye Blue Monday – I guess the name was a little too fitting on some of these places. Saw some good shows here and there was the right thing going on here. 4. Death by Audio – Can’t say the pain and agony is gone yet. This was a hell of a lot of inspiration for me wrapped up in a bullet. I guess that will keep me going just thinking of what the heck that means. I still miss you closest friend. 5. Roseland Ballroom – Not a usual hang but i guess lack of support is one of the things that have make things fall. Gwar was a special memory there for me. 6. 285 Kent – Dang the easy places I could walk to and see shows on a freezing winter night are done. Glasslands can make it on this list at midnight on the 31st unless the dj plays one more song…. 7. The ho_se – The hurdles of this good stuff disappearing better lead way to some more fucked up party zones. 8. The Dreebs – This band was the greatest band of all time. If you got a chance to see this band whowA what an experience. 9. The Colbert Report – And where are we gonna turn to to watch some free comedy political national tv? 10. Christo Buffam – This guy was part of my NY. For other people it is other people. It is a shame we have to wait until things are over to regret all of the things we would have liked to have done. Go and call up that friend. Get out of the house and go see that band you like. Life is quick.